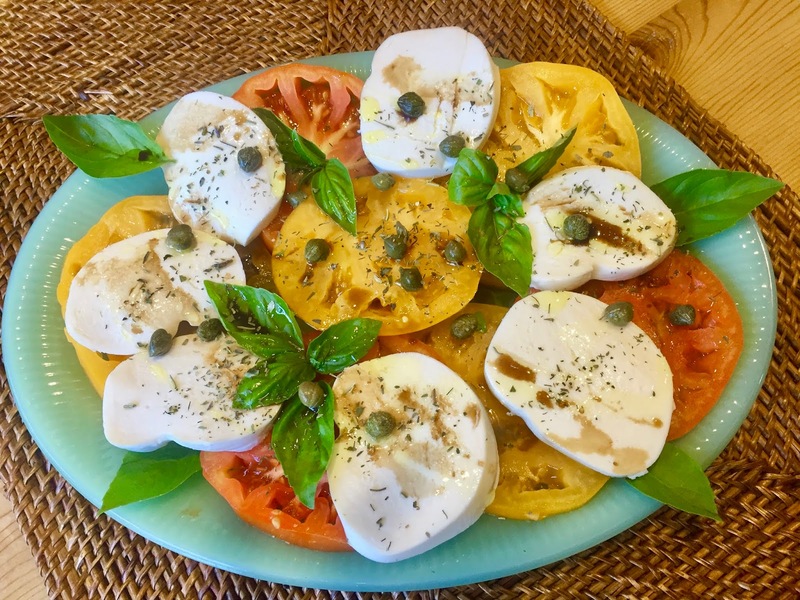 Nothing say summer more than a beautiful Caprese Salad. I love using farm fresh Heirloom tomatoes in alternating colors. You can use any type of tomatoes as long as the are freshly kissed by the sun not a water down hot house variety. Here in New England we anxiously wait through our long, cold, snowy winters for the local summer produce to appear in famers markets in all the charming towns indicative to our area. In the town that I live in Wednesday is farmer’s market day or if I am on Martha’s Vineyard you’ll find me Saturday mornings at the West Tisbury Farm market. Being of Italian heritage tomatoes are part of our fabric and growing up I benefited from my grandparents large garden with filled with all different tomatoes varieties; some like plum tomatoes my grandmother canned to use during the winter; others like Bonnie Original, Big Beef, Red Beefsteak heirloom, Better Boy and Cherokee Purple, we sliced for salad and sandwiches. My grandparents used all natural organic gardening methods passed down from their ancestors. Being raised on the best tomatoes I am very discriminating and ecstatic over the resurgence in fresh farm organic produce locally grown. 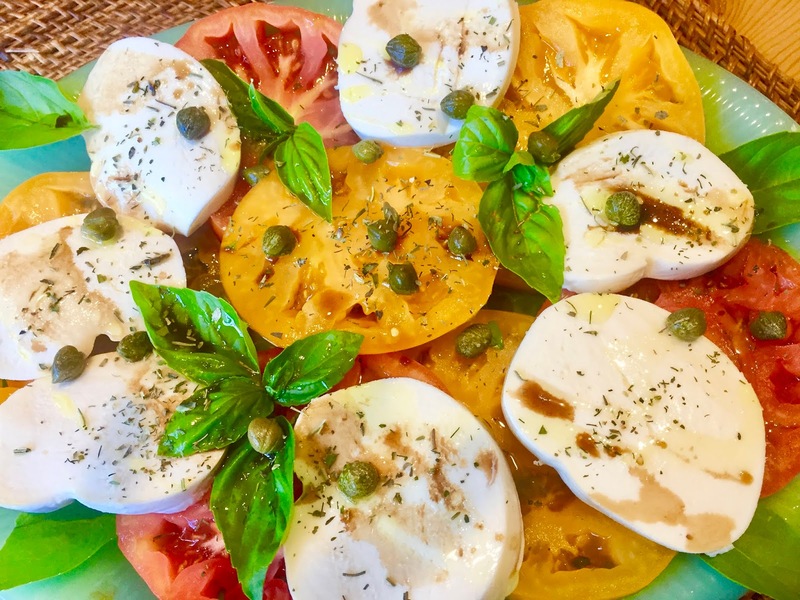 Mozzarella like tomatoes comes in many varieties, I love cheese so I use different types depending what is fresh at the market. Layer alternating slices of tomatoes and mozzarella on a large, shallow platter. Tuck fresh basil between slices. Drizzle the salad with extra-virgin olive oil, balsamic vinegar, sprinkle with capers and season with salt and pepper, to taste.